"Truncheon" starts off Accomplish Jazz with an opening line that sounds rather evocative of Eric Dolphy's "Out to Lunch." The similarity doesn't quite extend beyond that phrase, which ends with a long sustained note from the tenor and alto saxophones while guitarist/leader Lundbom does some pretty picking underneath them. But considering the name of the tune, which could be a mash-up of Dolphy's title and how the band takes this tune back to the trenches, it seems like less a coincidence than my bad habit of hearing similarities between different songs. Besides, it's a great jumping off point no matter what the origin. Lundbom is an intriguing composer and an even more idiosyncratic guitar player, writing songs that have wonderfully odd melodic quirks and playing solos with a tone that wouldn't be out of place in country music. Good country music. To further that point, Accomplish Jazz's one non-original track is a cover of the Louvin Brothers' "The Christian Life." That particular song choice could carry its own baggage with it (irony, understated religious beliefs) but the quintet plays it reverently, so nothing else matters. Part of the power of this disc can be traced to the caliber of the band, which includes two members of Mostly Other People Do the Killing: alto saxophonist Jon Irabagon and bassist Moppa Elliott, who it turns out was born with the first name Matthew, according to the credits. (Just a little extra surprise for those of us who care about the backgrounds of musicians.) Bryan Murray, who co-leads another band with Lundbom, plays tenor saxophone. Danny Fischer, who apparently made a name for himself in native Melbourne, Australia before hitting New York, plays drums. Irabagon balances his frenzied MOPDtK side and the more straight laced personality heard on his recent Concord debut. After Lundbom's solo on "Truncheon," the saxophonist enters playing fast lines over top of the rhythm section without letting his sometimes whiny vocalizing digress into shrieks. He realizes that would be too easy. Elliott shows amazing discipline during the 12-minute sort-of ballad "Phoenetics" by holding down the tempo with metronomic double-stops while Lundbom's metallic, dreamy noise drives Irabagon from pensiveness into pungent upper range honks. When Lundbom enters for his own solo, his clean tone makes him sound like a different guitarist, and his crisp execution is spellbinding. Murray's solo on "The Christian Life" starts with a smooth, almost gospel swing that incorporates guttural singing/growling through the horn as he blows. "Tick-Dog" begins with four minutes of a choppy guitar/drums duet before moving into a loopy rhythm that is based on Cedar Walton's "Bolivia" but also seems to have either the spirit or flair of both Tim Berne and prog rock. Murray's solo works over the horn's whole range, stringing together small phrases that make a fascinating whole. He also inspires the rhythm section to turn up the heat as they in turn drive him. "Baluba, Baluba" uses a solid funk backbeat and Lundbom avoids funky riffage in favor of another unique melody line, delivered with a bit of distortion. After Irabagon delivers another satisfying journey of a solo, the groove slows down and Lundbom and Murray call, respond, agree with, interrupt and eventually talk over one another. Like the opening track, this one doesn't go back to the theme, it simply stops when guitar and sax have said their piece. That type of arrangement makes the music stand out more because it confounds listeners expecting to hear the head again, and it leaves more of a lasting impression. The same can be said for this whole album. Since it came out in December, it's still eligible to wind up on 2010 year end lists, where it clearly belongs. For some reason, Mr. Lundbom's review has drawn a lot of spammers on a daily basis, so the comment section has been disabled. 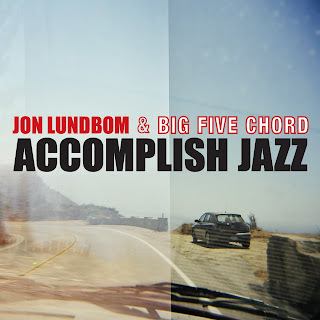 I'm sitting here trying to figure out an opening line for a review of John Lundbom & Big Five Chord's Accomplish Jazz CD and it's not coming. I'm making it harder than it needs to be. Allison Miller - a fine, fine drummer. She has a new album coming out this month and it just so happens she's playing Club Cafe the same day it drops. If that wasn't cool enough, Myra Melford is the pianist with her on that tour. Bassist Todd Sickafoose and violinist Jenny Scheinman are also along for the ride. Before I talked to her two weeks ago, I had no idea about the show. I was calling to talk about her new album with those cats, Boom Tic Boom. The interview was for a JazzTimes article, which I filed last week, bringing all the deadline stuff to a close for the big week of music. Allison and I have one degree of separation. One of her best friends used to live and play in a band with my ex-bandmate Megan Williams from Up the Sandbox. I was explaining this to UTS' singer Leslie Fleisher, and before I could get to her name, she said, "Are you talking about Allison Miller?" Turns out her girlfriend went to college with Allison. Maybe Allison should cover an Up the Sandbox song because of her connection to the band. Last Tuesday, I finally received a package from ESP Records. About two weeks earlier I received an email from them saying that they were having a special "Let's cut down on the inventory" sale, and select CDs were $6. I bought Frank Lowe's Black Beings and Don Cherry's Live at the Cafe Montmartre 1996 Volume 3. I also decided to splurge a little bit and bought the vinyl reissue of Albert Ayler's one-sided clear vinyl Bells. It's a limited edition of 1,000 and since Ayler's Spiritual Unity was out of stock, I opted for this one. I knew if I waited I wouldn't get it before it sold out and I'd rue the day. Now, of course if you've ever read this blog, you know how I feel about vinyl. I love it. I'm not quite ready to buy a vinyl album if it's nearly twice as much as the CD version (Historicity, in this case), but I've been known to pay a few bucks more that the CD price to get an album. And I understand that since vinyl is pressed in limited quantities that the labels have to charge a little more. I'm fine with that. If my extra bucks can help a label continue, I will support them. But if you're going to press vinyl, could you at least do a quality check to make sure it isn't pressed off center? I put Bells on and the tone arm was practically undulating. That's not really an issue with Albert Ayler since he plays with such wide vibrato that pitch is relative. But what about the Pearls Before Swine album that ESP just reissues? If I got that and "Surrealist Waltz" (the final song on the album) was all wobbly like that, you bet I'd be pissed. This isn't the first time this happened to me. I returned a BYG/Actuel album because the off center pressing ruined any kind of enjoyment I could get out of the album. My copy of Ida's Lovers Prayers has a lot of serious droning going on throughout it, and three of the four sides have pressing issues. The first song on side 4 has a noise at the beginning that could be guitar amp noise, but it sounds more like a scratch in the pressing. (I still haven't used my digital download for compare and contrast.) This isn't some flimsy vinyl either. This is 180 gram stuff that makes us vinyl geeks drool. I'm keeping the Albert Ayler record. For one thing, it's written as #18 out of a pressing of 1000. Besides, with a pressing that small, I feel pretty sure that the rest of the records are like that. But I hope the people releasing vinyl will realize that if this happens too often, the folks who love records won't trust them and then the vinyl action will really drop. Can you imagine how you'd feel if you purchased that latest four-record set of Monk at the It Club, only to find out the they're pressed off-center and that Charlie Rouse really sounds drunk? Don't let the title of this entry fool you. There are no collaborations - that I know of - going on between the popular pianist and Stephin Merritt, although that could be cool. I'm putting the two names together because last week I bought the latest releases by both artists on the same day during what turned out to be a Week of Music. A few times a year, I hear something that makes me think, Okay, jazz is very much alive and this person/band is taking it into new uncharted waters. Last year it was Stephan Lehman, as well as Chris Potter, both on their new albums as leaders. But I also thought about that at Interval, the Monday Night Jazz Jam Session at Ava, here in Pittsburgh. The music was being pushed into the future, into the Now and we have maps telling us where we are now (meaning that it makes sense) but we know that the next step isn't figured out. Excessive metaphors there, but hopefully you get the idea. Vijay Iyer's Historicity is like that. It has a bunch of his own tunes, an Andrew Hill piece and some other covers including MIA. They all work and they all smoke. Especially, no pun intended, Hill's "Smoke Stack," which originally was a tad lumbering because it had two basses. Iyer takes the melody and sprays it all over you. Even though I peeled the shrink wrap off in the car immediately after buying it, and popped in the CD player right then and there, it took me a couple days to get through the album. Not because it's that heavy, but because I was, uh, busy. However, listening to it a bit at a time made sure that none of it blurs together either. Magnetic Fields I didn't get to until today. Listening to it going to and waiting at Pennzoil for an oil change. Merritt is this generation's Cole Porter. All his songs are catchy and his lyrics are brilliantly witty. I need to listen to it again soon to figure out how much I like it. Last week was the Week of Music for me. So much so that there was no time for blogging between the music and snow, which hopefully will finally start to subside. I heard it's supposed to be 38 degrees today. Good riddance to bad rubbish and the mindframe in which it put me. Last Sunday, St. Vincent came to town, playing at Diesel. Pittsburgh ex-pats might not know the venue, but it was once known as Nick's Fat City. With new ownership comes better shows, but it's one of the worst places to try to literally see a band. Worst since Metropol. The visibility is obstructed on either side of the stage by metal girders, with several ceiling lights covered in beads that dangle to the floor. There's a second level so that floor requires there to be a low ceiling above the bar, which is positioned along the wall opposite the stage, cutting off the view further. Upstairs if you're not leaned up against the ledge on either side, looking down at the stage, you can't see squat. There are a few seats in a slightly sunken area, but you have to get there really early to get them. The soundboard takes up most of the area in the sunken section and they don't let people near there. I got to the show an hour after it started and the place was jam packed. It almost looked sold out. And I knew absolutely no one. (That changed by the end of the night, but I don't want to get ahead of myself.) I stood there wondering, Who the hell are these people? How do they know St. Vincent? They look a little too straight and too old to be college radio fans. Is this what Pitchfork readers look like? After wondering all this and waiting for someone to play (there were supposed to be three acts), a dude who looked to be about my age or a few years older walked up to me and started chatting me up. Turns out he was from Cleveland and drove down to the show in Columbus the night before, only to find out at the last minute it had been cancelled due to p.a. problems. That explained it. Much like some of the big name Warhol shows, it seemed like this show had drawn a lot of out-of-towners. Makes sense. Don't judge our music scene by this club, brothers and sisters. St. Vincent came on at about 8:30, just half an hour after I got there. So my timing was good. I like St. Vincent (I guess I should call it a band, as opposed to "she" since Annie Clark isn't the sole member anymore; at least not on this night) in part because the songs don't really sound like anything else I've heard, although there are touchstones, unusual and normal in a lot of the music. They play the kind of music that I'd throw under my favorite catch-all phrase: mutant pop. On the odd side, at least two songs at Diesel had melodies that really reminded me of the verse of Carly Simon's "That's The Way I've Always Heard It Should Be." Annie, if you're ready this, that isn't necessarily a slam. Everything written about St. Vincent talks about the challenge of taking songs that were created in the studio and trying to recreate them live. And it's a valid issue. She had a five-piece band, including her: drums, bass, guitar/violin, keyboards/sax/flute, plus her guitar. The drummer looked like he was playing synth drums or triggers on a couple songs, and switching to the kit when things kicked in. And several times it was hard to tell who was doing what, or if anyone was actually doing the strange sound in question or if it was generated by a sample. That always keeps things interesting but it also seemed to keep the songs from breathing a little more. There's no reason that she couldn't have allowed the band to sound more like a band playing the songs, as opposed to a recreation of the record. This is not to say I didn't enjoy her set. For one thing, it reminded me of how much I still need to explore her albums. (I bought her debut Marry Me that night.) Clark is clearly a really good guitar player too. She seemed to spend half the set playing around of above the twelfth fret, looking like she has plenty of technique that she can draw on when needed. A couple times she cut loose with some great guitar noise too. A few songs toward the end of the night, I saw my friends Peter and Jess, both from work. Turns out they had been there the whole time. A few days later, another work friends said he had been there too. I never would've known. Music Week continued on Monday when I finally was able to get a copy of Vijay Iyer's Historicity which I've been passively coveting for a couple months, and the Magnetic Fields' Realism. The latter album wasn't listened to until today. It took me a few days to get through Vijay too. But I'll explain that in the next post.